As the bus carrying me and a group of other journalists and analysts pulled up to the Troy Marriott hotel near Detroit last Monday night, I started doing what any self-respecting professional traveller would have done – looking for enticing dinner options. In an unpromising area, the only alternative I could see to the hotel’s own restaurant was a sports bar – imaginatively named “Champps” – just across Big Beaver Road. While it seemed unlikely to be a hidden gourmand treat, it seemed more enticing once I’d seen the hotel restaurant’s prices and depressing beer range. Yet I ended up all three nights of my stay trooping down to the hotel’s restaurant and ordering mediocre, absurdly-priced food ($29 for a pork porterhouse cooked so that it’s almost impossible to cut, anyone?) rather than venturing out. Closer examination revealed that, while Champps was close geographically, without a car it might as well be in the next state. There was no pedestrian crossing to take me across Big Beaver Road’s six lanes of high-speed traffic. Big Beaver Road did have sidewalks, unlike some suburban American streets (or stroads, as such highway streets are sometimes known). But they were cut off from the road and appeared built on the principle that pedestrians walk only in straight lines. Champps didn’t look worth the risk of a dash across the traffic. My near-yet-far experience with dinner options opened my eyes to how comprehensively some suburban areas of the US – and, to a lesser extent, some European countries too – are built around transport by car. I fully understood for the first time how oppressive the sheer lack of choice in such areas is. It made me appreciate how, whatever my gripes about London in the past and New York at present, I’ve at least lived in places that offer some transport freedom of choice. Big Beaver Road: would you risk crossing? Of course, many Americans would say I’m showing my East Coast elitist or European thought patterns by viewing such conditions as problematic. Suburbs are popular, some transport thinkers tell me, because Americans just plain want to live in single-family houses with a big area of land around them. It’s mere snobbery for those of us who live in big, cramped cities to expect those who prefer the lower-density suburbs to adapt to living lives more like our own. There are plenty of similar trends among pro-car thinkers in the UK. But my experience last Wednesday – when I went on a coach trip with other reporters and analysts from Troy to Toledo, Ohio, to see a car plant – suggested that the current arrangement wasn’t even working on its own terms. Because rain had slowed traffic, the tour bus was a good hour late arriving to pick us up. The driver then spent a further hour or so fighting through nearly-stationary traffic heading for central Detroit before he could drive at any reasonable speed on the way to Toledo. Our hosts felt under stress throughout the day – and curtailed one of the most interesting parts of our visit in Toledo – because of the problems of maintaining our visit schedules on roads that made travel times unpredictable. I, meanwhile, sat in something like awe of the quantity of traffic disruption related to traffic heading into central Detroit. “What would this be like if Detroit were still a healthy city?” I asked myself, staring at the ranks of red rear lights on the Interstate. The vehicles were heading for a city centre where many lots remain vacant and whose population is only a third of its more than 2m peak. It wasn’t the first time I’d experienced big, severe traffic jams in Detroit’s morning rush hour. The problems I witnessed are only an extreme example of the pressures that any city with low-density, far-flung suburbs with poor public transport and a dense inner city will tend to face. I had a taste of how even high-density New York struggles with such flows one morning in early April when a truck crashed on the Brooklyn-Queens expressway and closed both carriageways. I was suddenly sharing our neighbourhood streets with the vast lines of slow-moving car commuter traffic that outer parts of Brooklyn, Queens, Staten Island and the Long Island suburbs generate. I normally see such traffic only from a distance, and generally only creeping towards its destination. There’s a fundamental geographical problem. Distances in low-density suburbs are vast and forbidding for walking or cycling. But it’s hard to provide public transport for a place where the customers are all so far apart. When all those suburbanites jump into their cars to head for a city, the cars can’t all fit. the street where they live now? The root of the problem is partly social. I was watching in the rainy Detroit rush hour partly a distant reverberation from the shattering explosion of Detroit’s 1967 race riots, which wrecked vast tracts of the city and sent many white people – and quite a few blacks too – scurrying for the perceived safety of places like Troy. It’s an essential part of the bargain of living in a big city like New York – or London – that one puts up with – maybe even celebrates – living cheek-by-jowl with people of different racial or economic backgrounds or very different outlooks on life. Race riots, second world war bombing or, in New York City’s case, the deliberate policies of Robert Moses have broken that contract down in the cities now facing the worst problems. I’ve consistently voted with my feet on this issue. In my adult life, I’ve lived in dense, inner-urban areas of Edinburgh, London, Budapest and New York, prioritising convenience of walking, cycling and public transport over avoiding the hassles of inner-city life. Even when I visit the Detroit area or Fort Worth, Texas, I make a point of trying to stay in the inner city if I can. I’ve had aggressive panhandlers follow me and threaten me in downtown Detroit. But I still prefer the inner city’s challenges to the soullessness of the outer suburbs. None of which would matter, conceivably, if the suburbs were actually satisfying suburbanites. 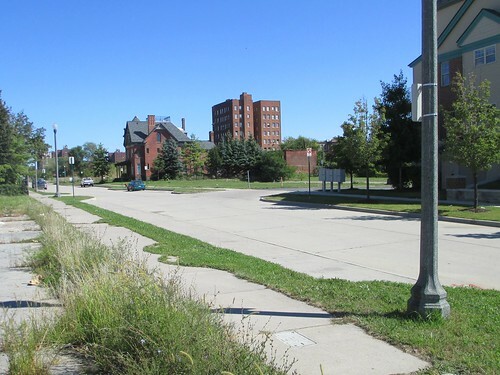 But, even with the continued pull of better schools and leafy tranquillity, there’s mounting evidence that leafy places like Troy are losing out to asphalt-covered, brick-built places like downtown Detroit. New York City holds more people than it’s ever held, while suburban Long Island's population has grown more slowly in recent years than most of the rest of the region. It’s London – not the suburbs of Hertfordshire or Surrey – that’s looking to cater for millions of new residents over the next few years. Places whose residents don’t need cars are becoming more attractive. My hotel window view: suburbanites' exercise yard. 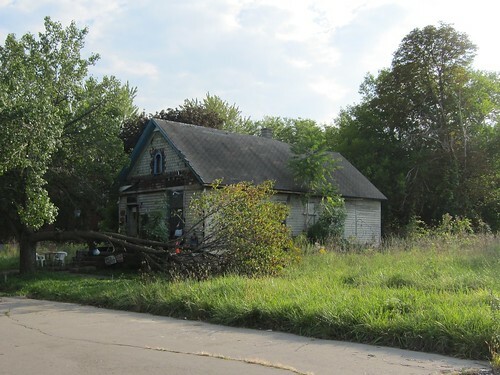 I won’t pretend, of course, that inner-city Detroit – currently bankrupt, long corrupt and full of houses being reclaimed by the prairie – is a paragon that other cities should follow. But the growing activity in its downtown and the sprouting of cycle lanes and the sight of the occasional cyclist give me some optimism. It’s easier for me to see why the attractions of places like clean, leafy Troy – where the only walking most people do is across the parking lot – are starting to pale. It’s no surprise to me that the US’s most successful suburbs – the DC suburbs in northern Virginia – are working hard at putting in bike lanes, improving public transport and making people who want a congestion-free car commute pay for the privilege. It would be heartening to see suburbs elsewhere – like Troy or the most traffic-clogged bits of London’s commuter belt – following suit. there politely. But Big Beaver Road it ain't. For me, meanwhile, the motor vehicle-dependence was at least temporary. I had a long wait on my return to LaGuardia Airport for a public bus but took pleasure in sharing it with others. I then transferred smoothly for my subway ride home, avoiding the chaos of the city streets above. I took still greater pleasure the next day in taking the day off work and heading out into the city under my own power. buses and bikes on the surface and even a cable car above. It wasn’t, I admit, a complete joy interacting with New York City drivers as I headed north through Brooklyn towards Queens. My first ride up the new First Avenue bike lane on the Upper East Side was marred by the discovery that drivers are as reluctant to yield to cyclists there as elsewhere in the city. Even on my ride north and round the top of Central Park, I found myself sharing the roadway with cars whose drivers viewed the park’s speed limit as optional. But, after spending most of the week by a road that was impossible to cross, I found it hard to feel truly angry. The best bits of the journey – the well-designed bike lanes up Kent Avenue, the bike and pedestrian lane over the Queensboro Bridge and the ride south by the Hudson – made me feel quite the opposite. What a privilege it was, I realised, to live in a city where few need feel wedded to their cars and growing numbers choose to get about by bike. As I embark on a new week of hustling for space and priority with the city’s drivers, I’ll do my very best to retain that feeling. I especially love this post because it's kind of a mirror-image experience to what I felt when I visited my sister in Brooklyn last summer. I was blown away by the number of alternatives to getting around by car that exist there, compared to Texas - Austin is at least pretty bike-friendly (including, I suspect, kinder and more patient drivers than you tend to experience in NYC) - but that's about it; the city's layout, most growth having taken place during the height of car culture, makes effective public transit a huge challenge. The ethnic and cultural diversity was amazing. And the population as a whole looked quite a bit more physically fit. There is a lot of walking between subway stations - which, for someone not accustomed to them, are like magic - you can descend into the ground and come out anywhere else you want! I see a lot of local resistance to expanding transportation alternatives. I think there's a kernel of fear in it; it isn't just about not wanting to spend public money on infrastructure that (it's perceived that) only a few people will use; I really think people sense that car culture isn't sustainable and it bothers them on a very deep level. I'm not sure how else to explain the level of anger I see attached to transportation issues. But after my trip last year (my first to NYC) I wish a lot more people would go and see how wonderful transportation alternatives can be! Thanks for your kind words - and I'm glad you enjoyed visiting our borough. We're quietly pleased with it ourselves - but you probably gathered that. I talked to the driver who took me to the airport on the way home and he had a similar story. He went to visit friends in Chicago from time to time and they sometimes visited him near Detroit. In Chicago, he was amazed how seldom it was necessary to use a car. When visiting the Detroit area, his friends found the need for a car frustrating. You're absolutely correct about the apparent magic of subways. It's a big point with me not only because my father devoted his life to working on and improving mass transit systems but because the subways in NYC held up remarkably well during this past winter (a point I documented here: http://invisiblevisibleman.blogspot.com/2014/02/the-c-train-my-childhood-and-why-subway.html). You're also correct about physical fitness. There was no missing that there were far more severely overweight people in Michigan than in New York. I'm sure transport plays a big part in that. As for why people get so angry about spending on alternatives to the car, I'm not sure why it raises hackles quite so much. But I think there are two main things. Motorists feel they're paying a lot to drive (even though they're nowhere near covering the costs of providing roads in most states). They also feel, I think, that mass transit systems represent the gummint's interfering in their inalienable right to drive wherever and whenever they want, without all the other people who are exercising the same right getting in the way. "Suburbs are popular, some transport thinkers tell me, because Americans just plain want to live in single-family houses with a big area of land around them." On a more serious note, unlike most countries in the world, Americans are deprived of the opportunity to live in car-free urban areas. One does not even have to go to Europe or Japan. Amtrak will take one from New York to Toronto, home of North America's largest urban car-free zone. Where the high demand to live there can be seen whenever a lottery is conducted for spots on the 15-year-long waiting list to buy a home in the car-free zone. For every spot on the wait list, over 10 people lay out $125 for a chance to win it. In Europe and Japan, compare the real estate prices in urban car-free zones with prices outside the zone. For example, in Venice vs. the adjoining mainland. People vote with their wallets for car-free living whenever they are offered a choice. Too bad that in the USA there is no choice. Thanks for your comment. It's true that supply and demand suggests people want to live in less car-dependent places - though there's a fair demand to live in, say, the DC suburbs too. The DC suburbs are fairly car-dependent, even if they're trying to address the issue. It's hard to foresee immediately anywhere in the US going for the car-free idea, though I know you're keen to see one for all of Manhattan. I guess my feeling is it would be nice to see far more car-tamed areas in the US - places where cars are prevented from ruining all urban space. More of those places are a possibility - although where one would start with Troy I don't know. the D.C. suburbs are very different. Arlington is right across the river from D.C and closer to downtown D.C. than much the the city. Arlington, unlike D.C. doesn't have a height limit so its full of office towers. It looks more like a central city in many ways than downtown Detroit. The suburbs of D.C. have car dependent places but also many pockets of transit oriented development. For example when I worked in silver spring, I needed a car for local errands, but could walk to the subway to go downtown for dinner. its too bad you didn't stay in a better area of Detroit or better suburb like Birmingham or Royal Oak. Thanks for your comment. 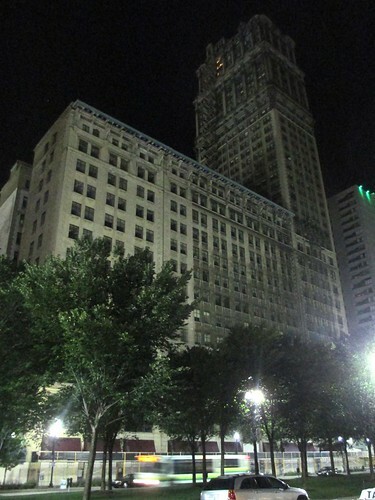 As I say in the piece, I try to stay in downtown Detroit when visiting the area. Unfortunately, on this occasion I was in the area to report on an event at Chrysler's headquarters in Auburn Hills. Given their distance from downtown, it made more sense to stay in Troy.